Click here to read the review first published in Ethos - ACT Law Society Journal September 2013 - Issue 229. The successful practice of family law requires mastery of a complex combination of skills and knowledge. Practising Family Law takes up where theory leaves off, providing clear practical guidance on how to conduct family law matters. Step-by-step coverage is provided on the full range of essential skills required in the day-to-day practice of family law in Australia. 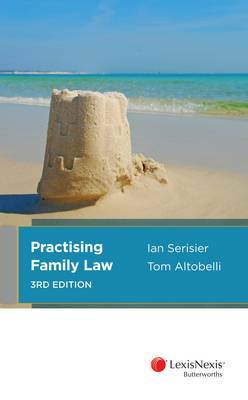 The third edition of Practising Family Law has been both revised and substantially expanded. Seven new chapters such as Financial Agreements, Family Law in the Federal Magistrates Court, Child Support, and De Facto Financial Proceedings in Family Law have now been included and coverage on dispute resolution and mediation has been extended. Practising Family Law is an excellent resource for practitioners, aspiring family lawyers and students studying family law wishing to consolidate their skills in this dynamic area of legal practice. Features &middot;&nbsp;Clear step by step guidance provides confidence in conducting family law matters. &middot;&nbsp;Fully updated and expanded to include all key aspects of conducting a family law matter.